Hunter Foods has just taken Hunter’s Gourmet to the next luxurious level with the launch of its first super premium gourmet flavour, Black Truffle, in the Gold Edition. By simply opening the canister, the captivating fragrant aroma of the black truffle will come straight at you, making your tasting buds full of anticipation. The golden potato chips are hand cooked into perfection, with the irresistible fruity and earthy black truffle flavour engulfing each bite of that savoury crunchiness. These chips would be some of the most decadently delectable chips that you would have ever had! All it is left would be for you to burst out with “Wow, that was amazing!”. Black Truffles’ aroma does not diminish when they are heated, unlike white truffles, but becomes even more intense. Did you know? These truly hand cooked potato chips are thicker, crunchier and delectably flavoured, to give you that satisfying snacking experience, bite after bite. The Gold Edition is also available in premium gourmet flavours such as Thai Green Curry, Wasabi and Turmeric and Cherry Tomato and Olive. Available in the following retail stores in the UAE: Eppco, Enoc-Zoom, Spinney, Geant Express, Franprix, Grandiose, Emarat stores. 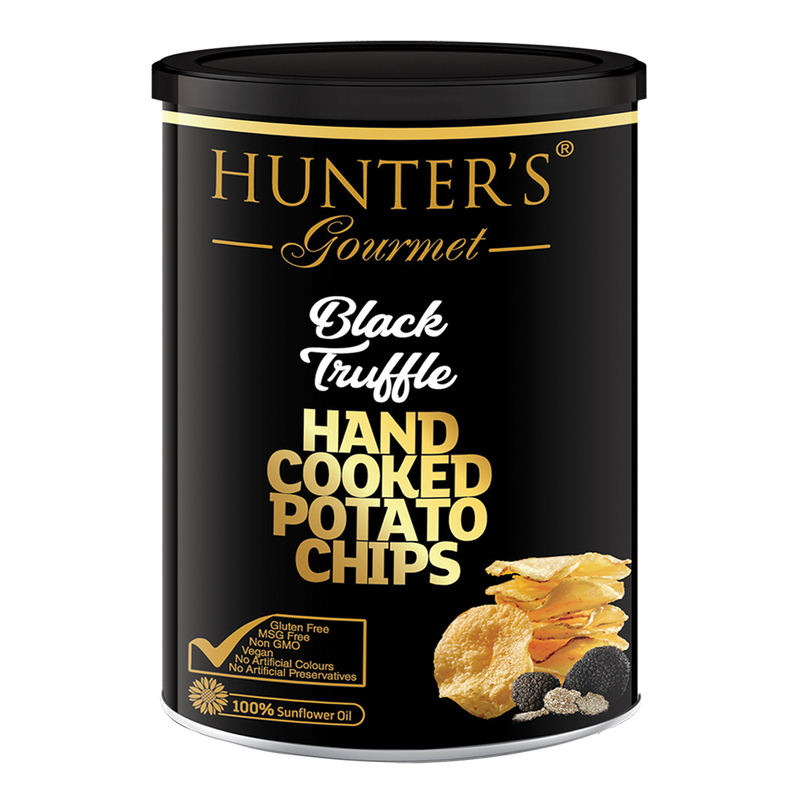 Hunter’s Gourmet Hand Cooked Potato Chips – Black Truffle – Gold Edition (150gm) 150gm Canister. Potato Chips, Vegan, Gluten free, MSG Free, Non GMO, No Preservatives, No Artificial Colours, No Transfat, No Cholesterol, Halal, Dairy Free, Lactose Free. Potatoes, sunflower oil, black truffle flavour [maltodextrin (potato), salt, sugar, flavouring (black truffle)]. Manufactured in a facility that stores and/or packs peanuts, tree nuts and products of gluten, dairy, soya, mustard and celery. I actually teared up from happiness! found them at Zoom and was blown over by the explosion of swoon-worthy aroma of black truffles! It was my first experience tasting black truffles and I was totally blown away, enjoyed eating every bit of it. It was so delicious, fresh, scrumptious and the salt content was just right ….. my family loved it. I should get more over the weekend from the local EPPCO outlet. the best black truffles flavor tasted so far, keep it up Hunter Foods! The best ever delicious potato chips. I can’t stop eating! Gone from the shelves. Where can I get this now? So, so good! Where can we get this? Seems to have been pulled out from the shelves. I love it! Soooo good. . . .I was so Lucky that I got to try all the Hunters Product at the Gulfood2019. 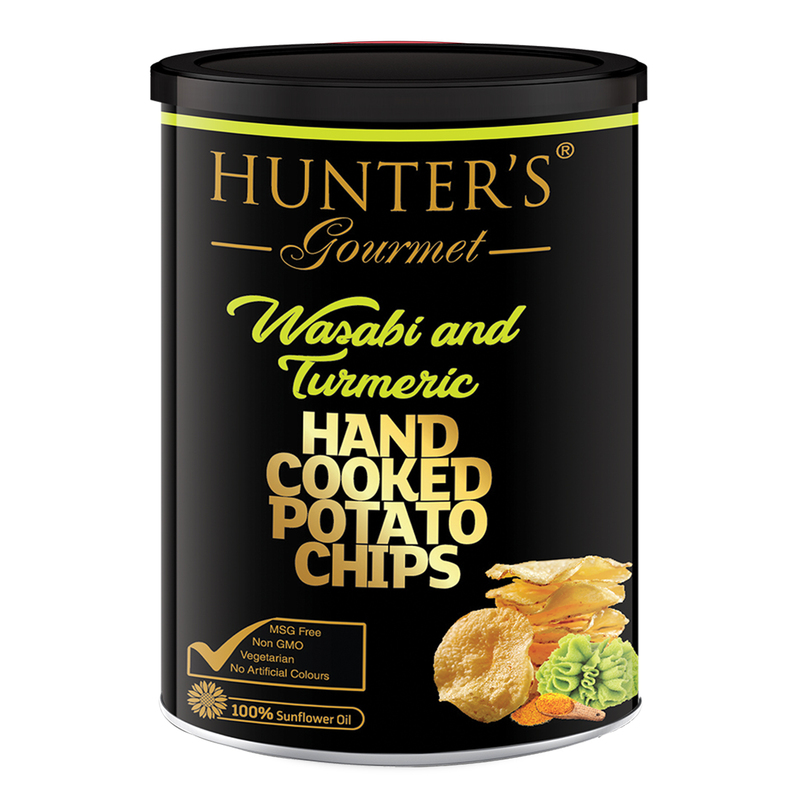 This Black Truffle Hand Cook Potato Chips by Hunter’s Gourmet Product is one of my favorite, It’s not spicy like the rest of the gourmet products. Very addicting, I remember that I almost finished the bowl coz I can’t stop eating Haha. I highly recommended this delicious guilt free snacks. . .
. . .I love Black Truffle Hand Cook Potato Chips, it’s love at first taste at Gulfood2019. . . The best flavor ever! I love truffles so truffled chips is a like a perfect combo! No one else has it! I tried first time the Black Truffle Hand Made Potato Chips and I am extremely fall in love with this delicious and healthiest snack and now it’s become all time favorite of my family because it’s vegan and gluten free. It has a delectable crunchier taste which after finishing everyone says . We want More more more . I highly recommend it to all of them to try this once and u never stop them eating. Tasty and delicous potato chips .My lil son loved it super yummy.I recommend all to buy this. So addicted and so crunchy! Ï love this Hand Cooked Potato chips because of its rich flavour and the smoothness with which it melts in the mouth. Yummy and Fresh as always. I love it. My kids love it too. So crunchy, tasty and healthy that’s the caption I could give for this amazing product. My son loves the mixed vegetables. Since it’s a gluten-free product my kids can enjoy it anytime. Variety of choices, perfect for every mood. “I love this Chips as it is yummy and has a enriched flavour that smoothly lingers in the taste buds and makes every bite as heavenly. My kids too love it. It is best because it is fresh and love the taste.